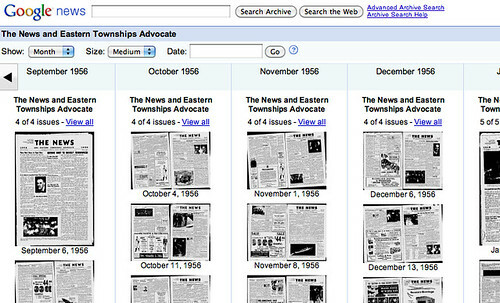 Google News Archives Adds "Browse This Newspaper"
Home > Google News > Google News Archives Adds "Browse This Newspaper"
If you go to the Google News Archives and find a digitized back issue from the Google archives, you should be able to now browse that newspaper directly on Google. For example, let's take a look at the The News and Eastern Townships Advocate. I can then browse the newspaper by panning through the pages. We're excited to announce the launch of browse mode for newspapers in Archives! To do so, click "Browse this newspaper" to view other editions from that newspaper!